The Edlers at Emmaus: Christmas!! I finished work last Friday and headed to the airport to pick up my sister, Leah which the boys were very excited about. On Christmas Eve we had our annual themed Christmas Eve party. 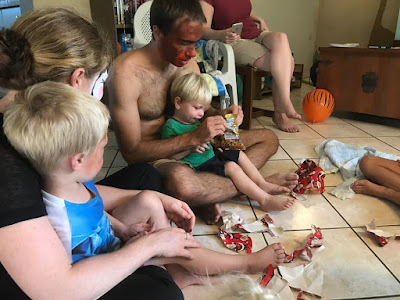 This is a tradition which came from Bill's family, every year on Christmas Eve one of the kids would choose a theme, they would decorate the house, dress up and eat a meal which would tie in with the theme. Now Sam is old enough to understand what is going on we had to start. 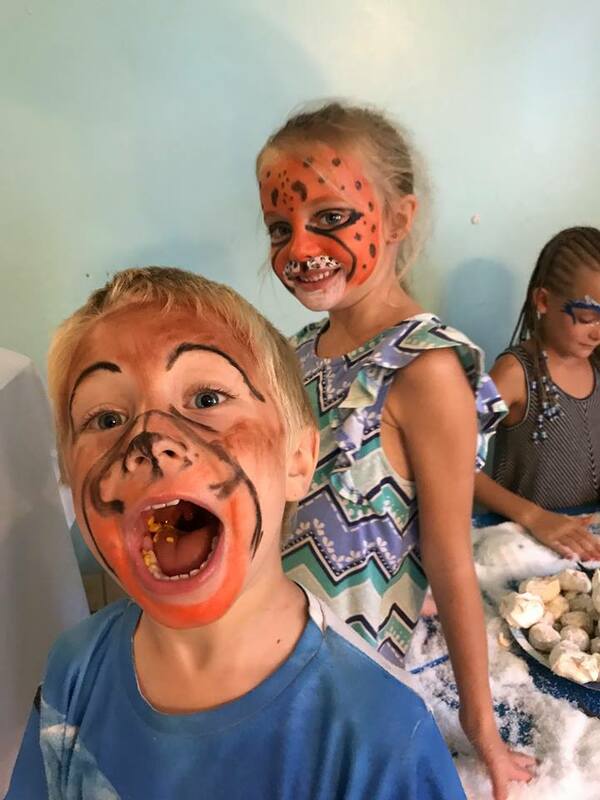 We invited the Ayars over for our Zoo themed party! The kids (and grown ups!) all had their faces painted, the house was decorated, we ate 'animal food' and played some animal themed games. We had a great time! On Christmas day the boys opened their presents and had a great time doing so. Joel was so funny, he had to play with everything for a wee while before he moved onto the next present. We had Christmas dinner with the Ayars and there was no turkey or ham but a roast chicken dinner hit the spot! On boxing day Leah always goes to watch a football match with my dad, this year we took her to the beach along with some friends. She made sure she got live updates of how the match was going!! The kids had a great time on the beach! I was back at work on Thursday and Friday. Friday was the official opening of the new physiotherapy building. We had a special service with staff, missionaries and even radio 4VEH!The building is beautiful and exactly what we need. Dr Rodney was so proud that all the materials for the building were from Haiti and the building was designed and built by Haitians. Even some of our physio equipment was built in Haiti. He explained one of the biggest things a missionary can come and do is to train nationals and that is our goal for this new physio building. We want to employ a local Haitian physio technician who will work alongside me so that Bethesda can provide long term physiotherapy services. Please pray for the funds we need to employ a PT tech and that God will give us wisdom in choosing the right person. I have been anxious to get into the building for a long time but the timing has really worked out perfectly. Yesterday a team of 6 PT's from the states arrived and will be working at Bethesda all week. We have around 60 patients booked in for them to see this week and in the afternoons they will be doing education sessions for 20 Haitian PT technicians. Today was great they brought a whole lot of equipment and knowledge which will help me out after they leave. I have lots I already want to fill you in on but I think that will have to wait until the weekend!! I am working everyday this week, Bill is back to work tomorrow and Sam is back to school on Thursday. EBS is moving into a month of intensives so our visiting professors arrive at the weekend and students start classes next Monday. Hope you all had a lovely Christmas and Happy New Year! Everyone is always telling me how happy the boys are...here is a photo to prove its not always the case!! Joel is truly a mummy's boy! !